For Tisha's Looking at the Sky meme this Friday, I chose a photo that I took the other night while I was out walking along scary railroad bridges and hoping that no hobos jumped out from underneath like the troll in the Three Billy Goats Gruff! For all who left comments (yes, Sarah, I have read Pet Sematary and you're right, a gun works much better than pepper spray!) and told me to bring Amanda with me next time , I've already put the kid on notice that she will be accompanying me on all further walks in the woods just in case I need someone to call 911 while I beat off a rabid squirrel or something! As I was walking back over the railroad bridge I just barely managed to capture a shot of three ducks taking off from the Yantic River and into the clear blue sky with nary a cloud in sight. Personally I rather like the silhouetted affect of the black against the blue, what do you think? For other pictures of the sky that you're sure to like, don't forget to swing by Tisha's and check out the linkies! Great shot! You couldn't have done better if you had planned it.Frame this one. Luv it! 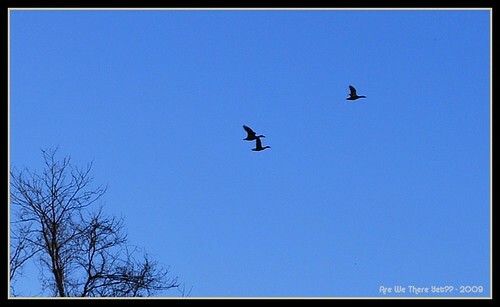 Perfect blue sky, clean silhouettes of the ducks AND the trees in the corner ...great symmetry in this one! Ohhhhh Linda! This is REALLY beautiful! I agree with Dee wholeheartedly - this deserves a frame! What a deep blue background! It is one of my favorites! Beautiful, Linda! Almost like a duotone. hey there Linda - that is some INCREDIBLE shade of wide blue yonder! The ducks actually seem to be moving. Very well done. Very nice shot Linda. The sky is so very blue. Awesome. Makes me want to fly with them! Your photos below of the bridge are astounding. The colors and textures really come through. And the one of the RR tracks and trees in the distance would look great on a magazine cover. I have to agree that black looks good on blue! I wonder why there is no cloud in sight, lol! I like the stark blue sky, the black silhouette of the tree and the ducks. You did good there, Linda. My birds flying pictures don't do so hot. I suppose those ducks just got in from Texas, we told them winter was over and they could go home. Most of the snow birds are driving their turtles north too now. Just don't get caught driving behind one, they are slow and hard to pass. Sorry I didn't get here sooner, thank you for your visit and nice comment (old cars).